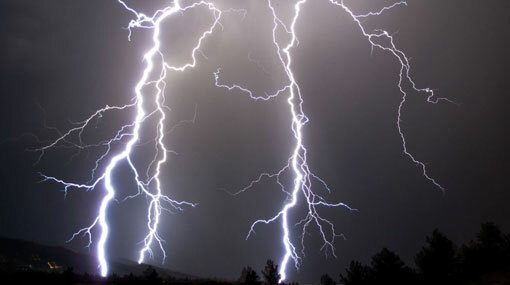 There is a high possibility for afternoon thundershowers with severe lightning over most parts of the island during the next few days, the Department of Meteorology stated. The general public is kindly requested to take adequate precautions to minimize damages caused by lightning activity and localized strong winds during thundershowers. Showers or thundershowers will occur over most provinces of the island after 2.00 p.m. Heavy falls of about 100 mm can be expected at some places in Sabaragamuwa, Central, Southern, Uva, Western and North-western provinces and in Anuradhapura district. Showers or thundershowers will occur at several places in the sea areas off the coast extending from Kankesanturai to Batticaloa via Puttalam, Galle and Hambantota, the Meteorology Department said. Heavy Showers or thundershowers may occur in the sea areas off the coast extending from Galle to Potuvil via Hambantota. Winds will be Westerly to South-westerly in the sea area extending from Kankesanturai to Matara via Colombo and winds will be South-easterly or variable in the direction in the other sea areas around the island. Wind speed will be 15-25 kmph in the sea areas around the island.